"Ermagosh, Becky, tonight is going to be SO FUN." [rolling on floor] "I'm going to THROW UP, and then I'm gonna DIE!" Happy New Year, everyone. I recommend coffee. And a mop. Thanks to Anne B., Mary Beth H., Jenn K., ZC, Bethany G., & Mathea T., who's pretty sure that pile came from the other end, but how often do I get to use Grinch quotes in here? NOT ENOUGH, that's how many. 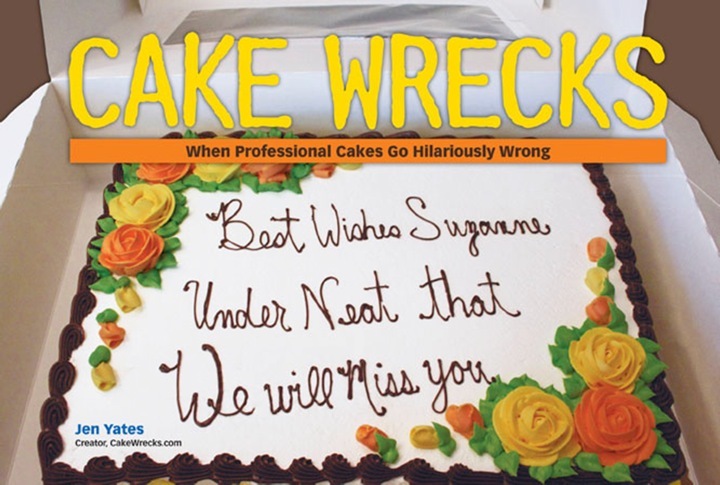 Here's to a new year filled with more laughs and thoughts from the CakeWrecks family.... Great start to 2015. Thanks for all you do (Jen, John, Sharon, the Wreckies, and all the behind the scenes people that we don't know about)! Happy New Year! May all your wrecks be spctacular! what Grinch quotes? I dont see any. My New Year's resolution is 1980 x 1310, thank you very much. But may your New Year rock! Okay, I admit it: I would totally buy that first one, if the price and sell-by date were right. Looks like it auditioned unsuccessfully as an extra on Spongebob. Also, all those bug-eyed, brightly colored mop head cakes that show up here routinely? Y'know, the ones which look like limbless versions of the French fry-loving "goblins" associated with a certain (in)famous fast food chain? I love those, too. ...and a GIANORMUS bowl of Menudo with oregano and onions! Happy 2015!! @ Mel the one quote "I'm going to throw up then I'm going to die" was from the 2000 movie version of How The Grinch Stole Christmas where The Grinch and Max was careening out of control on the über powerful jet powered sleigh that he created with junk from Whoville. I totally read the first one in LSP's voice. Great post & Happy New Year everyone. Woohoo! Wondered what the first post of this year would be. It did not disappoint lol. Drunken elephant things everywhere I look..scary. Better than dead drunken clowns I suppose. OMG I just choked on a fruit loop reading your commentary for these cakes. My 2 year old grandson had to give me the heimlich!